Nations Around Our Table: Look What She Gave My Baby! Every year we have our special family Nativity Celebration and one of the special treats that we make is Lime Sherbet punch. 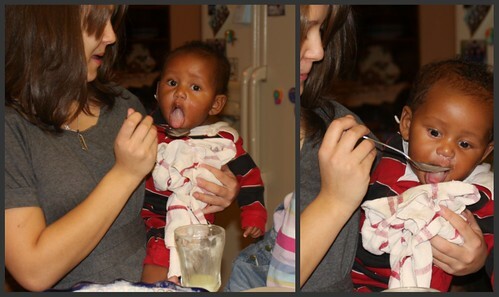 Well, Kalyn thought it would be fun to give some to Keshawn. 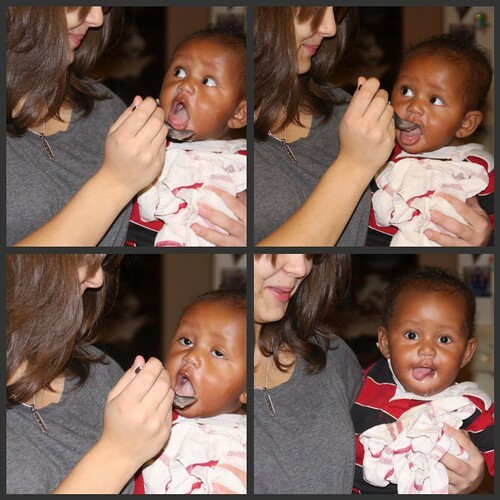 She thought he would probably make some funny sour faces, but what happened was love at first taste. He would fuss at her if she didn't get more into his mouth quick enough. I think he also fell in love with Kalyn a little more that night. Oh my gracious...if that isn't the cutest thing EVER!! My goodness, do you guys just gobble HIM up constantly?!! I'll bet his feet don't hit the floor for many years to come. 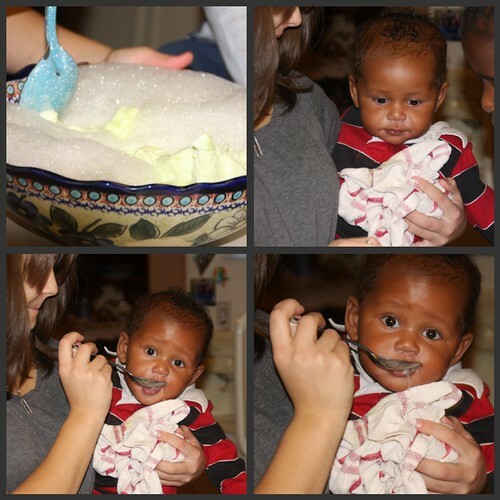 Sweet Jesus, thank you bringing Keshawn into his forever family! Ok that boy is just too precious! Glad to see smiles and everyone is feeling better! It just cannot get sweeter than that, my friend. After Christmas sounds PERFECT. I just have to meet the new addition. Shonni, how in the world do you get anything done - you must be kissing those cheeks all the time! Behold the beauty! So funny that he kept wanting more! I've never heard of that kind of punch - is it easy to make? Oh my goodnes...what an adorable series of photos! So happy that he is home and discovering the joys of lime punch! LOL... too funny! I love his faces! LOVE the 5th one!! With his eyes rolling back, like he's saying "So-this is heaven!" Hmmm, what sweet photos of the sipping event!